Rubin has been kind enough to lend me his blog for today and for that I am eternally grateful. He is very protective of this space, so I will do my best to honor every minute I have here, though I suppose talking about my love for other dogs is probably not going to make him happy. Again and again I fall in love. 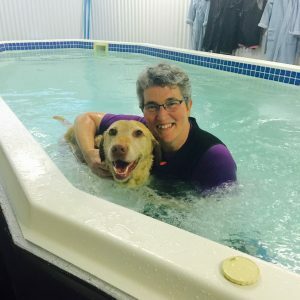 Every canine client is so unique and they seek massage, acupressure, and swim therapy because they have a family who loves them and who seeks the best life for them. But I don’t just mean “love” in a light-hearted way or in what I call a Hallmark way — the overused “love” that is used with equal value for ice cream and music and a nice pair of shoes. I mean “love” on a whole different level. I wish there were another word for it, but love is all I’ve got. So instead of trying to define it, let me try to illustrate it with a couple of examples. One of my first clients in the pool was a sweet gal named Bebe. I don’t have many photos of her, but I have this amazing photo taken by Gloria Cropper of Gloria Cropper Photography. I’ll admit it, when I first started working with Bebe, I didn’t love her. She came for swim therapy because she was getting on in years and her mom wanted to slow down the progression of arthritis and because Bebe LOVED (there’s that word again) to swim. Bebe loved swimming so much, it was difficult to get her to do anything else, specifically relax and rest during massage time in the pool. I tried everything from holding her in my lap to standing her on the bench by the side of the pool to massaging her while she swam (not an easy feat). But Bebe was having none of it and so we did this hour-long dance where I’d let her swim and then try to massage her and then, when she got antsy, I’d swim her some more. Then I’d give her another break, start in on some massage and just wait for her to demand more swimming. This went on for a couple of months until one day, Bebe figured out she could lie on the top step of the entryway of the pool (the step was about 6 inches under water) and there she’d plop herself after a good swim set and stretch out, like a swimsuit model in a fancy magazine. And that’s when she first allowed me to really massage her and that’s when I fell head over heels in love with Ms. Bebe. Bebe was in charge and if you didn’t respect that, she’d let you know with a bark or a sideways glance or she’d up and just walk the opposite direction. But Bebe was also funny and charming and kind and tender and if you gave her enough time to get to know you, she was trusting. I swam and massaged Bebe up until her passing at the age of 16 almost 17 years old. She no longer laid on the top step in those final years, but rather grew fond of lying in my lap to receive her massage. She loved her massages as much as she loved swimming. I had the honor of being present to give Bebe her last massage in this life and to watch her transition to the next in peace and surrounded by so much love. I loved Bebe and that love came over time as we both learned to trust and honor each other. I miss her silly smile and her stubborn, single-minded determination. I always will. More recently, I met a new client. 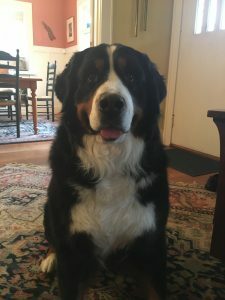 Her name is Willow and she is a large, gorgeous four-year-old Bernese Mountain Dog. Because I just met her, I only have a couple of photos, but even in these photos, you can see why she’s an amazing show dog quickly earning her way to confirmation championship. Willow is shy and bold and expressive. When I first walked into her house, she alerted me with a warning bark that rattled the window with its baritone vibrations. The barking went on for a good ten minutes as Willow danced around the living room backing away from me and then stepping forward to catch my scent. I let her bark while I talked with her mom and soon, Willow settled down. Well, by settled down I mean that she no longer barked at me, but she was still uncertain and sat by her mom giving me a cautious look. I suppose it’s odd for dogs to have a stranger enter the home who is solely there to touch them. I wait until I am invited, of course, but other than talking with the family, the hour in the house is focused on massaging the dog. While all my clients know that, some often running to their dog beds in preparation, just like with Bebe, it takes awhile to establish trust and routine. With Bebe it took months. With Willow it took about 30 minutes. After all her barking and cautious staring, once she figured out why I was there, she let me do my work and by the end of the session, she flopped her athletic body into my lap allowing me to work deeply on the tight muscles of her back. I fell instantly in love. Like right over-a-cliff-in-love and every week that I’ve seen her, I just keep falling. But with love comes heart break, which is oddly something I didn’t consider when I first started this work. While some clients only need me for a short time — to help with recovery from an injury or surgery — other clients are with me until their passing. 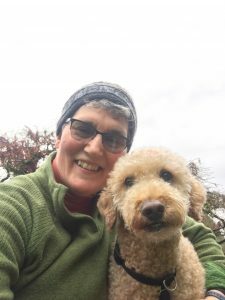 When I first started this work, I didn’t fully consider that my clients are mortal and that I might be giving them their last massage before they crossed the Rainbow Bridge. 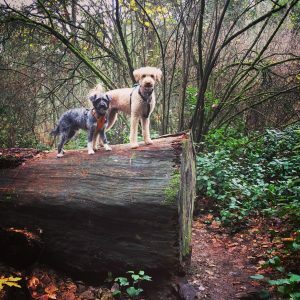 It’s kind of silly that I didn’t think about this, but over the past eight years, I’ve had to say goodbye to many dogs who have been a part of my heart. The loss does not just encompass the passing of the dog, but also the end of my relationship with the family. Not always, but unless they need me again or stay in touch after their dog is gone, I generally (though not all the time) don’t see or hear from them and that’s a loss too. Which is why my view of love has changed over these years. Yes, it’s full and bright and wonderful, but it is not a constant or rather it is not a consistent magnitude of love — steady or predictable. The love is always there in one form or another, but it has peaks and valleys, flows in trickles and waterfalls. Recently, I lost one of my favorite swim clients. Her passing was sudden and so unexpected and sadly, way too soon. Her name was Bella and she was such a steady and beautiful girl. She swam with me every week, originally coming to the pool because there was a fear she’d injured her knee. Her knee was only strained, thankfully, but because Bella loved swimming so much and she was reaching middle age, her mom kept bringing her to the pool. Bella was a lab so swimming came naturally to her (though I must admit, it doesn’t always come easy for some labs). 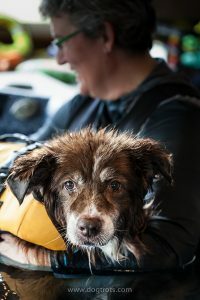 She would swim low in the water so we added a life vest as well as a “swim cap” to help keep water out of her ears. Unlike some labs, Bella wasn’t a wild and crazy swimmer. She was slow and steady, happy to be doing what she loved, but equally happy standing on the bench at the side of the pool getting massaged. My love for Bella wasn’t immediate nor was it a mad crush. It was steady and sure and solid — loyal, if you were, just like her. When she suddenly fell ill and her illness overtook her body, the world felt unfair. 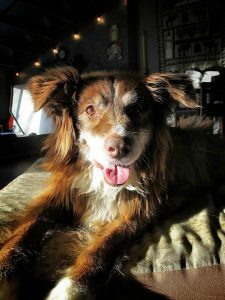 Bella was the kind of dog who deserved to live well into her teens. She was all things good and she was supposed to cross the Rainbow Bridge after her bright light faded. Unfortunately, this did not happen. She passed way too early and the shock of her loss is devastating for her family and to me. Love plays a big role in my work. And loss does too. I suppose that is the way of love — to fill your heart and then move on its way, leaving the weight of memories. 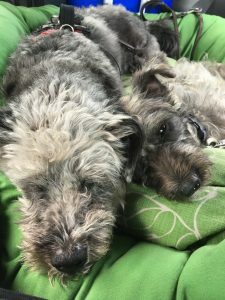 Often, I have heard my clients say that they are not sure they can ever live with another dog after a dog passes. “It hurts to much to lose them,” they say. I understand this, though I don’t think I could ever have a meaningful life without a dog in it. When I think of all the dogs (and yes, cats…and llamas and sheep and horses and even parrot) who have filled my heart with love, I feel lucky and yes, blessed. Their passings devastated me and yet, having known their love has also strengthened me, enriched me in ways immeasurable. Recently, I heard this poem read during an interview with a writer and director. I remember hearing it in the car and then crying so hard, I had to pull over and collect myself. 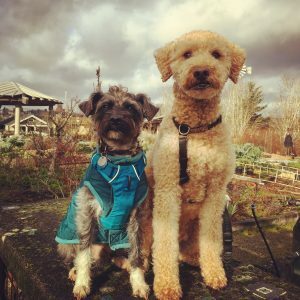 It’s a simple poem, but I believe it captures what I cannot capture in this blog — what it’s like to love a dog (though I doubt the poet was talking about animals when he wrote it almost 1000 years ago). I know there will be more dogs in my life with whom I fall in love. I love each of them, of course, though I will admit there are some who capture my heart in surprising ways and who bring me “painful joy” like Bebe, Willow, and Bella. But it is, as the poet says, a holy thing to love and even though I am not a religious person, I truly feel blessed every time I fall in love with my dog clients. And as I type this, my own dogs sleep by me — Oscar, our most recent arrival, curled up under the desk sleeping on the bed that was once reserved for our oldest now passed dog, Dezi. Oscar was, almost instantaneously, attached to Dezi and Dezi was happy to have a younger, adoring fan in little Oscar. Their love was strong and constant, and I imagine that Oscar misses the old man as much as we do. 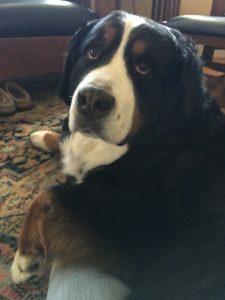 And then there’s Rubin, who has graciously allowed me to not only write on his blog today, but who also allowed me to write about the love of other dogs. I could write forever about my love for Rubin. He is, as they say, my heart dog. He will be 11 years old soon and I just can’t imagine it — the years flying by so quickly. He was never an easy dog, but in so many ways we are connected, always have been connected; our love for each other seems so constant, I can’t ever imagine my life without it. It’s been fun to watch Rubin and Oscar establish their own relationship — Rubin, hesitant and unsure at first, but Oscar persistent and demanding until Rubin finally gave in. Their love is very brotherly — looking out for each other and covering each other’s backs when needed. They sleep next to each other, which is something Rubin would never allow with any other dog. With Oscar, though, he seems content and I am so glad they have each other. And I am glad I have them because they remind me, on a daily basis, that love is not only beautiful, but it’s also nourishing. It takes time, it takes nurturing, and it takes trust. I feel lucky that every day, with my own dogs and with my client dogs, I get to practice that art of falling in love. I know it makes me a better person and grounds me in a way nothing else ever has. Try it sometime…fall in love with a dog and see if the world isn’t a better place!